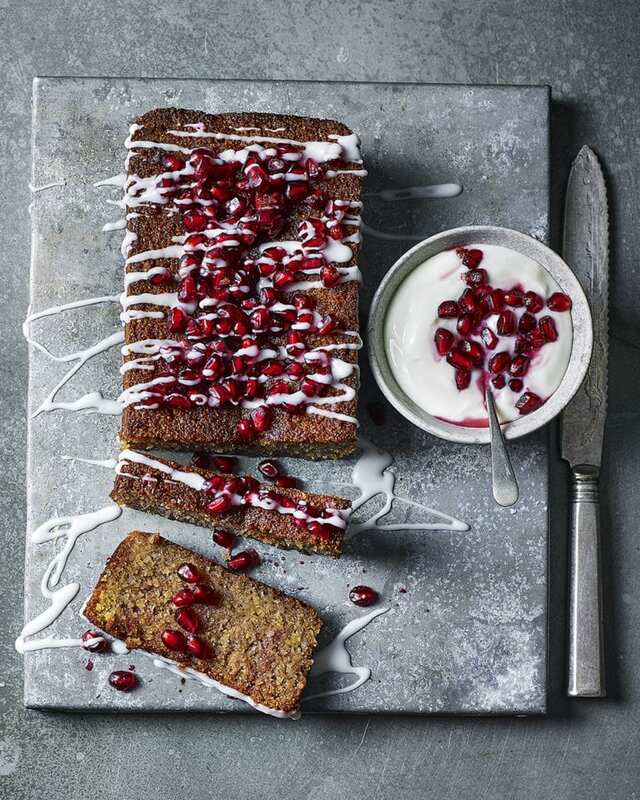 Try this beautiful, yet easy-to-make, almond and polenta loaf cake drizzled with fresh pomegranate juice and seeds. An afternoon tea recipe with a difference. Heat the oven to 180°C/160°C fan/gas 4. Halve the pomegranate and remove the juice and seeds (see step 1). Reserve a quarter of the seeds, then use the back of a spoon to squeeze the remaining seeds through the fine mesh sieve into a jug. Discard any pulp left in the sieve. at a time, then fold in the almonds, polenta and orange zest. Mix briefly, then use a wooden spoon to stir in the yogurt and 3 tbsp of the pomegranate juice. Transfer to the prepared loaf tin and bake for 50 minutes or until the cake is well risen and feels firm to the touch.